MANILA, Philippines, August 31, 2012 (ENS) – A large earthquake jolted a sea area east of the Philippines on Friday and a tsunami warning was issued for the Pacific region. After a small, local tsunami, the Pacific Tsunami Warning Center has now lifted all tsunami warnings and alerts. The tsunami warning was initially posted for the Philippines, Japan, Indonesia, Taiwan, Papua New Guinea and other islands in the Pacific and the U.S. state of Hawaii. The U.S. Geological Survey rated the earthquake at a 7.6 magnitude, while the Philippine Institute of Volcanology and Seismology, or Phivolcs, said it was a magnitude 7.7 earthquake. The quake caused power outages in several towns and killed one person in a house collapse. Phivolcs said the earthquake’s epicenter was recorded in the Philippine trench, between Samar Island and Mindanao at 8:47 pm local time. Phivolcs Director Renato Solidum said a tsunami warning alert was posted for the coastal areas of eastern Samar, a province in the Eastern Visayas region, as well as parts of southern Leyte province and Surigao del Norte province. Solidum said residents in these areas are advised to evacuate their homes and go to higher ground as a precaution. He said aftershocks from the quake are expected. 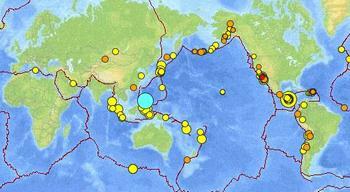 In the past seismic activity along the boundaries of the Philippine Sea Plate has produced seven great (M>8.0) earthquakes and 250 large (M>7) events.